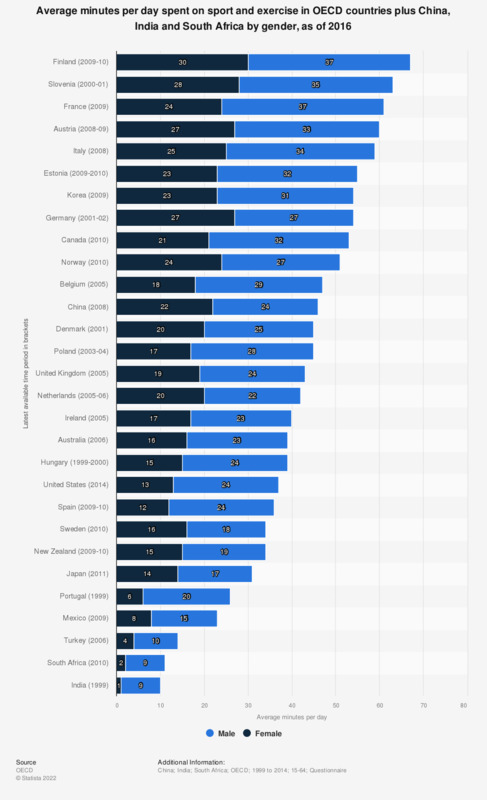 This statistic provides a comparison of the average amount of time in minutes spent on sport and exercise per day by gender in OECD member countries as well as China, India and South Africa. As of 2016, Germany was the only country in which the average minutes per day spent on sport and exercise were the same for both genders with averages of 27 minutes. Sports does not include watching sports as a spectator. When you are on a personal or leisure trip, which sources do you typically use to decide on activities/excursions to participate in once you have arrived at your destination? What would you need today to better enjoy your garden? Before your trip to this park today, did you use any of the following sources to find out information about the park?